Superman is on his knees amidst the wreckage of a destroyed city. His uniform torn, he is bleeding. He blames an unseen force for the carnage. A booming voice responds, "It's too late. It's all too late." An earth-shattering explosion breaks off chunks of the earth's crust, akin to the destruction of Krypton. Unconscious, Superman is hurled into space. Multi-colored lights appear in the abyss. Superman is swallowed whole. Clark Kent walks into the Daily Planet. He is invited to an event at the Infinity Corporation in New York City. Lois, somewhat tongue-in-cheek, assumes he will take her along. Clark notes the lack of a 'plus one' on the card. He has to 'fly' if he is going to make it to New York in time. The MAW, or Metropolis' Super Max Prison, houses the region's most dangerous meta-humans. A person, by the name of Jones, masquerades as a security guard. He uses mind-controlling powers to steal a casket-like cart. Loading it onto a helicopter, he flies off. Superman flies to New York City's Infinity Corporation. They have hidden the crest of the House El under a lead foil in the invitation. The secretive invite proves they know Superman's secret identity. Superman is in for a shock. As he enters a laboratory, he sees dozens of dead Supermen. Identical bodies piled on top of each other. Bloodied, with torn costumes. Before he can fully absorb the situation, Superman is told that 'another one' is coming through the portal. Yet another battered Kryptonian is teleported into the room. Superman rushes to his side. He is alive, but barely. The embattled hero struggles to give Superman a warning with his last breath, "Don't trust him." Upon realizing he has lost another Superman, the scientist operating the controls, throws a keyboard in frustration. This is the only Superman to teleport in alive. With this death, he has nothing to show for his work. Over sixty attempts. Regaining his composure, the scientist introduces himself as Vincent, and says, "Welcome to The Infinity Corporation, Superman. We're trying to save your life." The faux security guard delivers the stolen casket to a clean energy power plant in Metropolis. At the United Nations, Aquaman addresses the assembly. The international community has proposed a trade agreement with Atlantis. 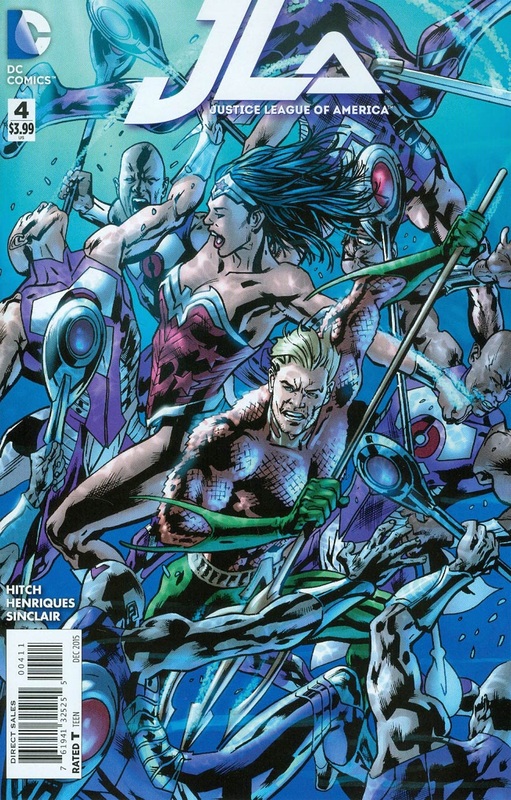 Aquaman, representing the ocean-dwellers, declines. He explains, as a far more advanced society, there is nothing that Atlantis could want or need from the Western world. There is neither a reason for Atlantis to trade, nor a reason for the West to fear an attack. Aquaman is called away. Someone, looking for Olympus, is waiting for him in at Atlantis. At Infinity Corp, Vincent tries to explain the situation to Superman. Something called the 'Stones of Forever' has brought him Supermen from different realities. These deaths are a harbinger of all of time being destroyed. Vincent does not know how or when Superman will die. But in his mind, if Superman survives this coming apocalypse, so too, will the world. Green Lantern, Wonder Woman, The Flash, and Batman converge on Metropolis' power plant. They have all been given invitations similar to the one Superman received. The stolen casket begins to drain Hal's power ring. Parasite emerges. He absorbs both energy from Hal's ring and Barry's speedforce. Parasite grows into a Godzilla-sized monster. Back at Infinity Corp, Vincent alerts Superman to the power plant battle with Parasite. Superman races to the scene. Parasite is so large, he swallows Wonder Woman whole. Superman shoots through Parasite's stomach like a bullet, rescuing the Amazonian. Hal hits the villain with a barrage of hard light constructs. Aquaman returns to Atlantis. The unseen figure waiting, refers to himself as a prophet. He says the time for false gods is over. The true god is coming. The security guard returns to his employer, Infinity Corp. He is now a she. A shapeshifter. Cyborg teleports into the fray. The Flash races away to prevent Parasite from absorbing any more of the speedforce. His power levels drained, Hal has been knocked unconscious. His ring responds by initiating an emergency evacuation procedure. A wormhole opens up and takes him, and accidentally, the Flash to OA. 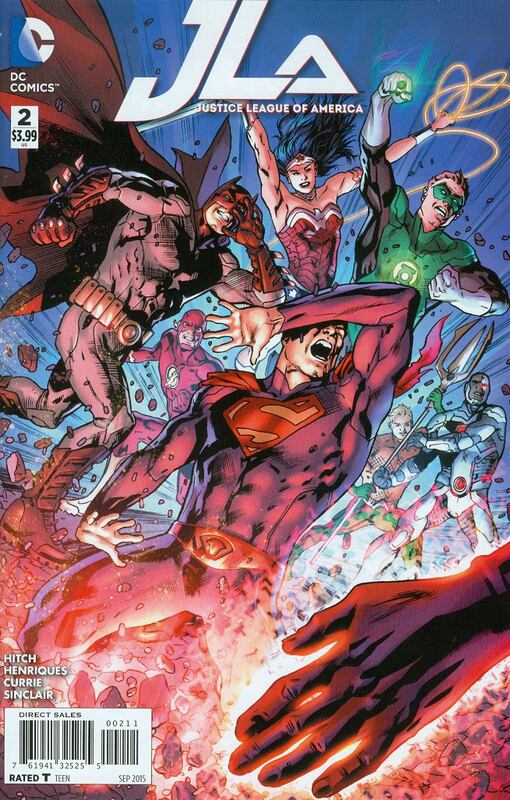 Superman holds off Parasite while Batman and Cyborg operate the power plant. Supes sends his arch-enemy crashing into the complex. The techno-heroes have repurposed the plant, depleting the Parasite's energy instead of providing it. Superman knows that the mysterious Infinity Corp is behind Parasite's attack. With Wonder Woman missing, Cyborg teleports the three remaining JLA members to the Infinity Corp address. But the building has disappeared. A giant space ship hovers over New York. Descending down from the ship's lights, is Rao. The Kryptonian god himself. Rao, the Kryptonian sun god, appears in angelic-like glory. Superman is a believer. But a mere touch sends the Man of Steel plummeting toward the ground. Batman tells Cyborg to hold back. He wants to see if Rao will save Superman, or let him suffer a painful and destructive fall to earth. Rao, evoking Jesus cradling a helpless child, saves the hero. Superman does not understand his momentary powerlessness. Rao explains that his 'grace was too much for him.' He calls upon Superman to proselytize on his behalf; to prepare the way for his coming. The presence of Rao has a positive impact on the crowd below. Couples fall in love; the blind are made to see. A prophet of Rao asks Aquaman if he can preach to the Atlanteans. Arthur does not believe in gods, but reluctantly agrees. The Air Force surrounds Rao's space ship, dubbed the 'Cathedral.' Superman intercedes, vouching for the people's safety. Perry spurs on his reporters to be the first to land the inside scoop on the Kryptonian god. At the Batcave, Cyborg reviews the 'Kryptonian protocols.' A comprehensive list of tactics designed to takedown Superman. Any plan that can negate a Kryptonian threat, might neutralize Rao as well. Batman will try to find Infinity Corp, and the missing leaguers. Lois writes an article questioning the need for another god. But she also asks, if a Kryptonian man can impact the world as Superman has, then what could a Kryptonian god do? Global representatives assemble at the Cathedral. Superman introduces Rao. He lays out his intentions: to bring peace and wellness. The god has already sent out his prophets to every hospital. They miraculously heal every afflicted person they find. Though Superman seems to be a true believer, he questions Rao's motives. He wants to know why Rao was just a myth on Krypton, but a reality on Earth. Rao claims he had achieved his goals on Krypton, then left to explore the galaxy. When he returned, things had deteriorated beyond repair. Rao watched Krypton's destruction. He saw Superman's rocket ship save him from certain death. Rao asks Superman's forgiveness for failing Krypton. While Superman's doubts are allayed, Rao's miracles stoke Batman's fears. For all the good he has done, Rao's equal-opportunity-healing means bad people, who might otherwise have died, will be back on the streets. Batman admits the death of his parents make it impossible for him have the hopeful outlook of Superman. Superman thinks of Diana. She is still missing. We see her awake in a chaotic swirl of wreckage. Olympus in ruins. 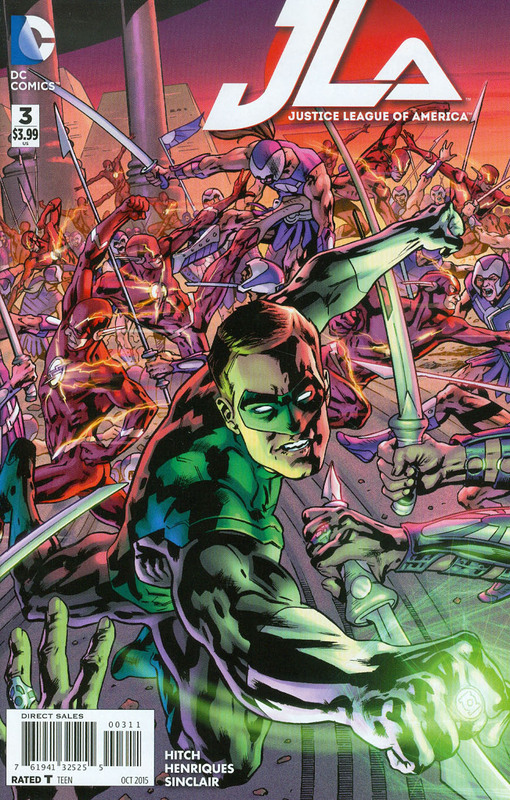 The Flash and Green Lantern arrive on an unknown world in the middle of a battle between two sides dressed in attire form the Iliad. Despite the planets heavier gravity, the Flash is able to create a barrier and allow Green Lantern to recharge his ring. Lantern repulses the fighters, but Flash disappears once he does so. Lantern discovers he's on Krypton, circa 250,000 years before Superman was sent to Earth. Unable to connect to Oa or gain any information from his ring, Lantern is about to leave, when he's stopped by the no longer fighting Kryptonians. They offer him the chance to talk to their leader, "The great god, Rao." Wonder Woman finds herself stranded on Olympus, which has been wrecked and abandoned by the gods. She speaks to an "oraculum," but like Green Lantern, is given no information that aids her. Rao is busy spreading his word through miracles across the planet, at a speed that has the leaders of the world worried. They consider asking Rao to desist until they can sort things out, but Rao appears and tells them that he will not stop until his work is done, even if he must be more vigorous to do so. The Batman meets with Superman, and questions how easily Superman made Rao acceptable to the world. He moralizes, then leaves Superman to ponder his decisions, as the Flash returns back from his space and time trek, no worse for wear. Superman hands Cyborg vial of his blood, asking him to test it. He and his father, Dr. Stone, are already working on Batman's Kryptonian protocols. Dr. Stone postulates about the endless scientific and medical advancements that he could achieve by mixing Kryptonian and Earthling DNA. Rao is recruiting people to become his new prophets. He needs even more disciples to spread his blessings to every single person on the planet. No one must be left behind. Even the UN Security Council votes to open their boarders to Rao and his emissaries. Batman has an unconscious, former criminal in an MRI machine at Gotham General. A doctor helps him scan his body, brain, and blood. He is trying to explain the radical change people are experiencing around the world. A quarter of a million years ago, on the planet Krypton, Hal Jordan is escorted to Rao, the current reigning god of Krypton. He is old, eccentric, and dozing off. Hardly the picturesque, Christ-figure that has come to Earth. He asks for Jordan's help in his kingdom's civil war. Jordan tries to beg off, citing well known sci-fi space-time laws. But the 300 year old potentate -and supposed deity- easily convinces him to help. The doctor at Gotham General has found protein marker in the former criminal's DNA, and parts of his brain enlarged. He is being genetically rewired. A Mother and Father drag their young daughter to be "blessed," against her will. As soon as she is touched by the prophet's staff, she is happy, and agreeable. Arthur and Mera watch the news from their lighthouse at Mercy Reef. Arther is confident, that the people of Atlantis will reject this god. Mera is not so convinced. Superman asks his computer at the Fortress for all of the information it has on the Kryptonian sun god. Rao uses his super-hearing to listen in on Superman, Batman, and Cyborg as they compare notes. Superman has the same protein markers that the new converts do. They theorize that these markers did not suddenly appear, as with the new converts, but were bred in, a long time ago. Speaking of a long time ago... Hal Jordan and the 'old' Rao prepare for a diplomatic mission to Argo, two hundred and fifty thousand years in the past. A ring of prophets encircle the old king, and transfer a portion of their life-force into the god. Rao is instantly younger, livelier, and ready to meet his enemy. Present Day: A prophet attacks Batman at the hospital. He and the doctor escape, but not before stealing the prophet's staff. Back at the Fortress of Solitude, Rao and his guard engage Superman. The supposed god is not happy with Superman's non belief. 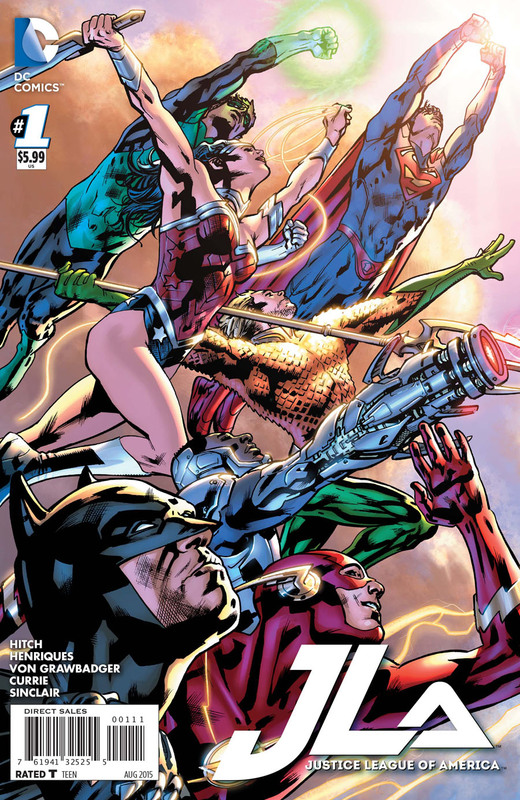 Here is a listing of the Justice League of America title from its introduction with issue #1 in 2015. Note: Remember, the dates listed for printed editions are from the issue covers, not the actual date when the comic was on sale. The date listed for digital editions is for the actual date the comic was on sale.